I am woefully behind with blogging. Writing on the road is hard! 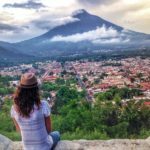 We’re currently in Antigua, Guatemala and we love it. 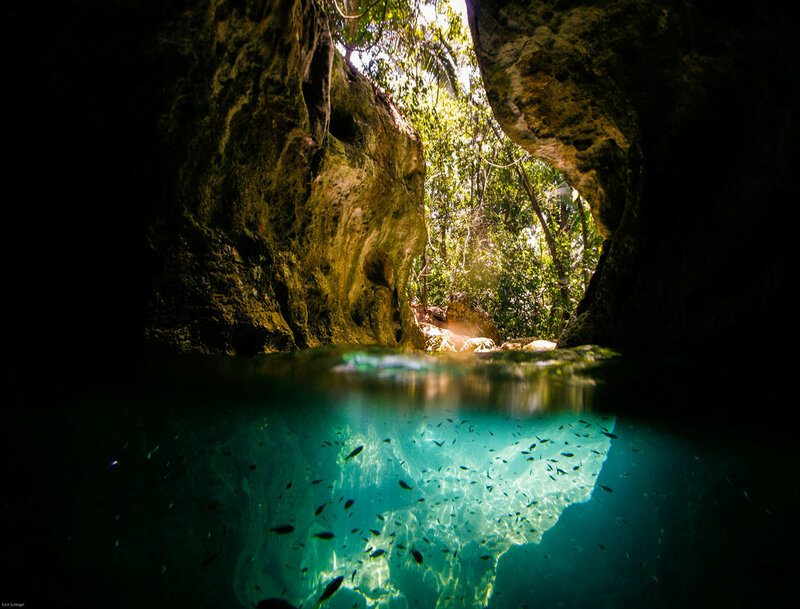 It’s by far and away my favourite destination so far and I really, really want to write about it, but first I have to do another post on Belize – in particular the Actun Tunichil Muknal cave tour. 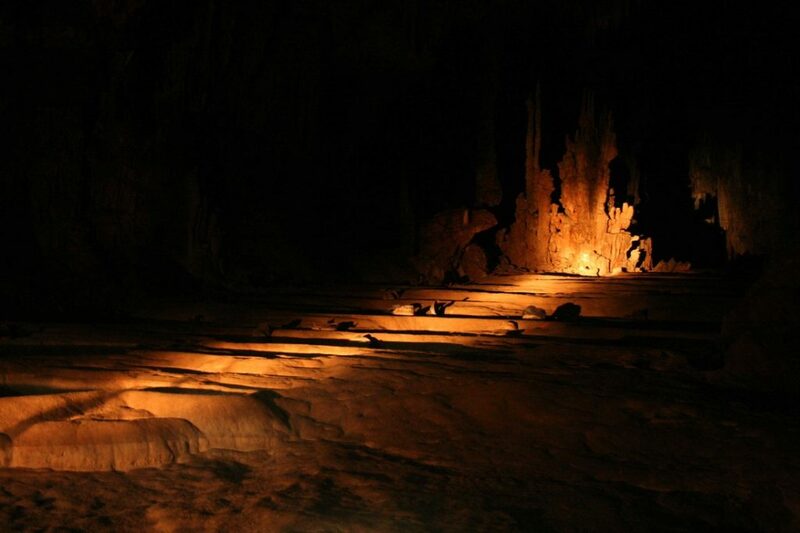 The Actun Tunichil Muknal cave (aka the Cave of the Crystal Maiden, aka the ATM caves) is a vast cave where the Mayans used to make human sacrifices from about 600 – 900 AD. 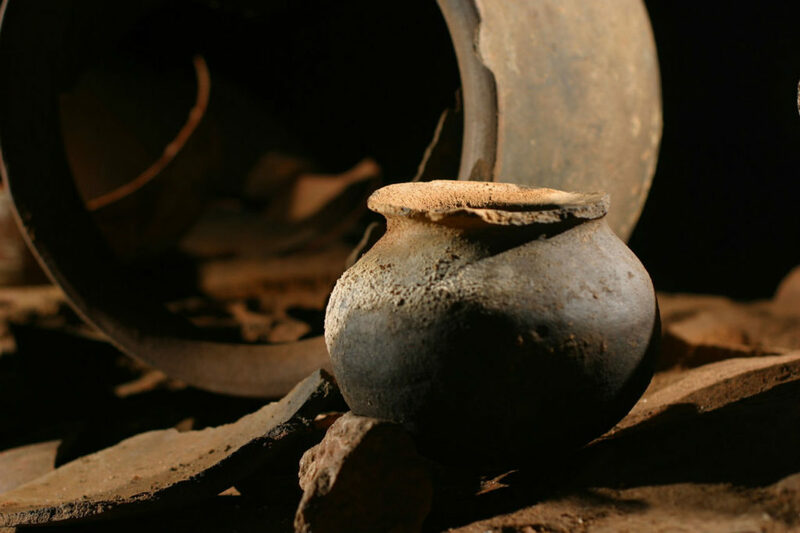 It’s one of the only places in the world you can see the skeletons of sacrifices left in their original places, as well as hundreds of Mayan artifacts and pieces of pottery. 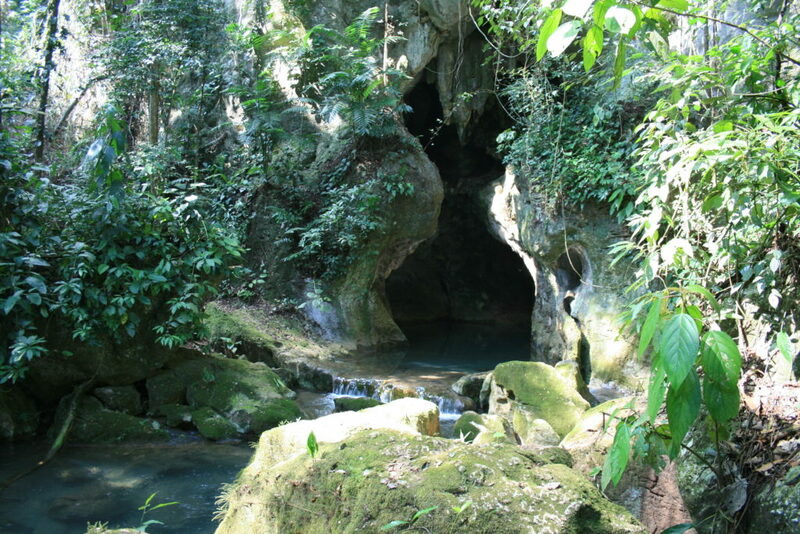 It’s situated in the middle of the jungle, so the tour also involves a rainforest hike and several swims across jungle streams before you can enter these ancient caves. We’d heard a few people say that doing the ATM tour was the best experience of their lives. Pshhh, we thought. Their lives must have been pretty tame/lame/boring up til then – but we’re from Brighton! Stuff goes down here. The tour will probably just be quite interesting, and hopefully fun too. But actually, it was incredible. It’s genuinely just like being Indiana Jones for the day. It’s almost impossible to convey just how exciting the tour is, how terrifyingly vast the caves are and how spooky the sacrificial skeletons are without actually being there, but I’ll do my best. NB: Really annoyingly, you aren’t allowed to bring cameras into the caves anymore. A few years back a tourist dropped their camera onto a perfectly preserved Mayan skull, shattering it and ruining things for the rest of us. So sadly none of these photos are mine. First things first: the ATM caves are huge. They’re 5 km long and are made up of countless different caverns and chambers, and to make it that bit more challenging there’s a river flowing through it. To get inside you have to swim through the cave entrance, and this is when we started to get seriously excited. The entrance looks like a Gothic archway and the water is a deep, clear blue. 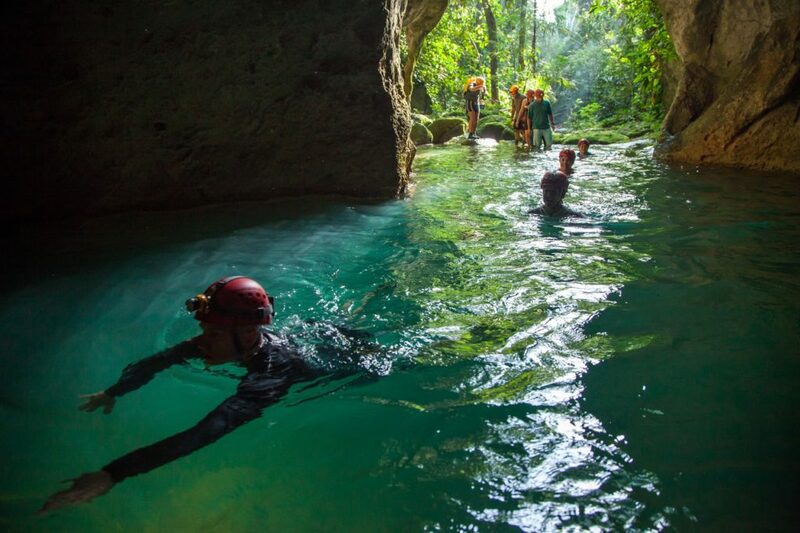 It was cold, but Belize is hot, so it was actually lovely to jump in and start swimming into the cave itself. We followed our guide into the cave as best we could. 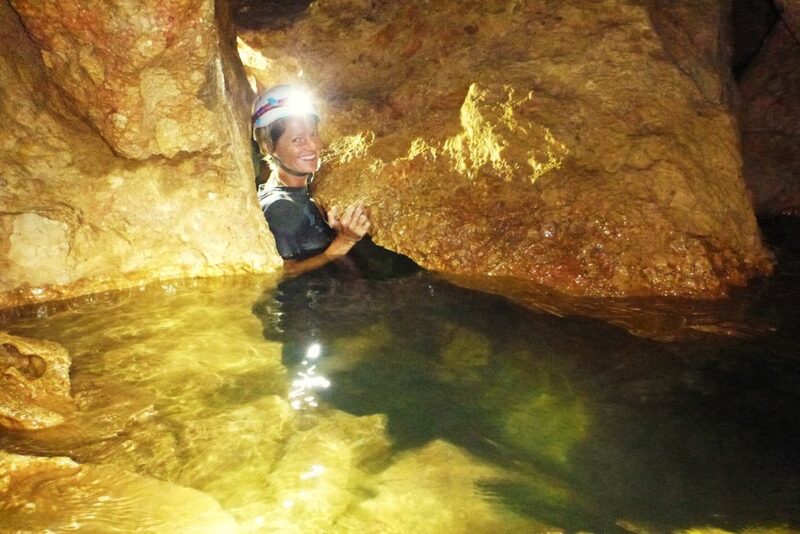 The depth of the water varied: sometimes it was dry and we could walk, sometimes it was waist-high, and other times it was so deep we couldn’t touch the bottom and had to hold onto the cave walls for help (swimming in dark caves in clothes, helmets and shoes is hard, guys!). We later learned that huge cave spiders hang out on the walls, but thankfully we didn’t see any – or worse, accidentally grab one (we did see a cave cricket though!). As we swam deeper and deeper into the caves, our guide told us all about their history. 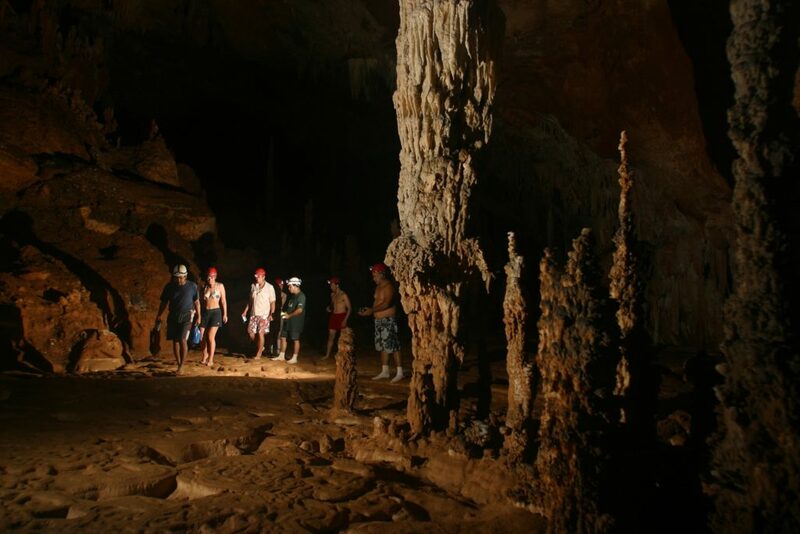 We learned a lot: about the different rock formations, stalagmites vs stalactites, the Mayan religious rituals and the hallucinogenic drugs they took while in the caves to get in the zone. We also learned how they killed their human sacrifices. Being pretty morbid, this interested me a lot. They can tell from the blunt trauma to the skulls that the victims died gruesome, violent deaths and they would have suffered greatly, even if they were under the influence of hallucinogens (god I hope they were…). The other way the Mayans killed their victims was disembowelment. How do they know this when there aren’t the battered skulls for evidence? Well, horribly, they can tell from the little nicks on some of the ribcages of the skeletons in the caves. The victim would have been alive when they were disemboweled, and our guide told us that as the knife pierced their abdomen they would have flinched (ya think??) thus causing the knife to chip away at their ribcage as they pulled back. Truly awful stuff, but incredibly fascinating. It was crazy thinking about this as we scrambled through the caves. 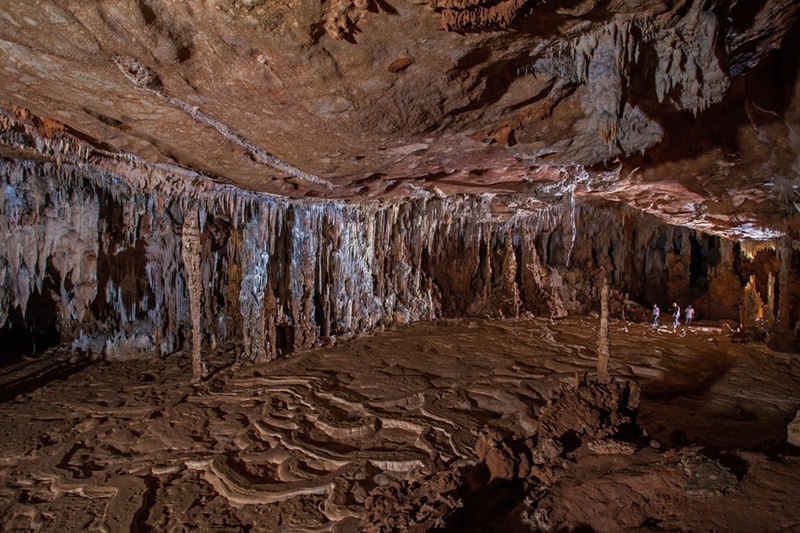 Over 1,000 years ago the Mayans would have made the same long, dark journey through these pitch black caves to what they believed was the underworld. How they managed to lead their victims through the dark tunnels and narrow crevices to get to the central main chamber without the use of powerful, modern torches is beyond me. Because the journey into the caves is hard. You don’t have to be physically fit exactly (luckily for me) but you do have to be relatively agile and not too big. To get to the main chamber we had to climb over enormous boulders, squeeze ourselves through tiny tunnels lying on our stomachs, swim through narrow passages and push and pull ourselves through tiny openings. Sometimes it would be so tight you’d have to first put your head through a gap, then angle your neck through and contort your body through bit by bit in order to squeeze by. That one was called ‘decapitation rock’. Nice. This is the type of experience that would NEVER clear health and safety regulations in the UK. We asked our guide whether there had been any serious injuries in the caves. He “couldn’t remember”. Hmmm. The guides lead you through slowly and of course you’re wearing helmets, but parts of it were still pretty scary, especially if you’re not good with heights. Tom totally stacked it at one point. 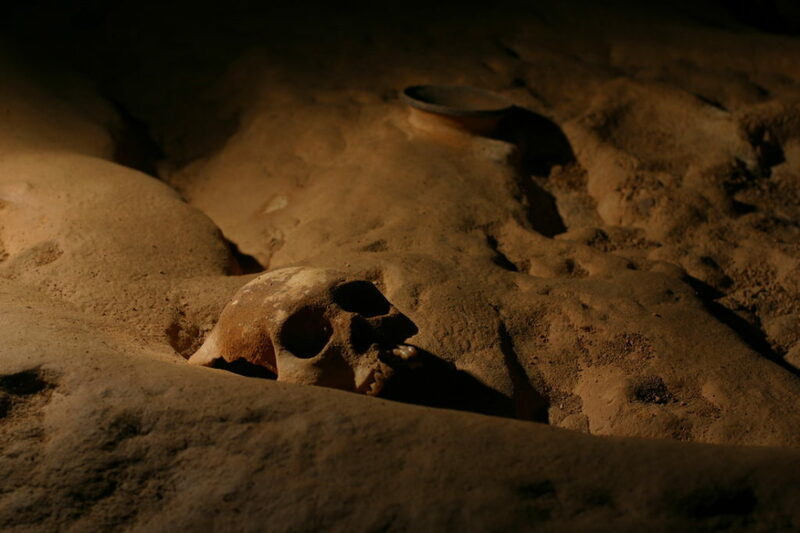 After about an hour and half of this we reached the main chamber – an enormous, cathedral-sized cavern littered with skeletons, pots and artifacts, all exactly where the Mayans left them 1,100 years ago. 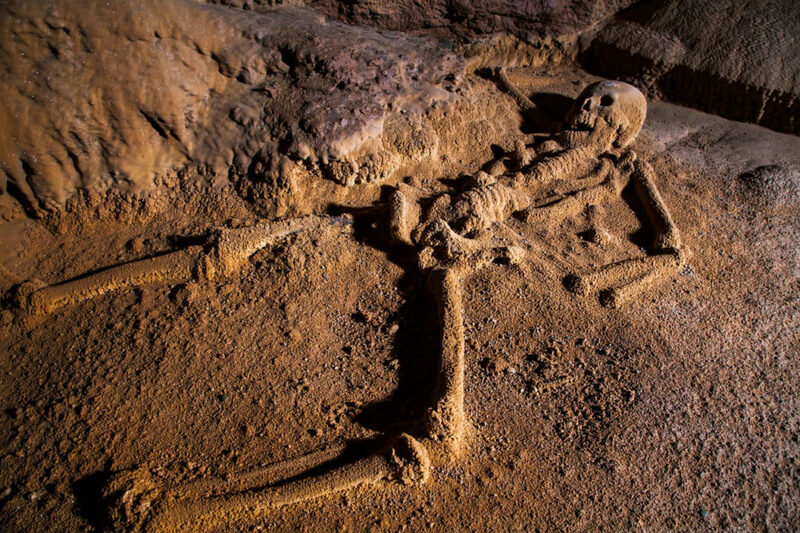 This is the final resting place of the famous ‘Crystal Maiden’ – a totally intact skeleton of a sacrifice victim which has become calcified so it sparkles like crystals in the gloom. Though scientists initially thought it was the skeleton of a teenage girl, they now know it’s that of young male under 20 years old. But the name ‘Cave of the Crystal Maiden’ stuck. You can’t help feeling sorry for this guy: in life he was a victim of human sacrifice, brutally disemboweled in a dark cave; in death he’s been totally emasculated. Our guide told us they now try to call him the ‘crystal dude’ – but it doesn’t really have the same Indiana Jones-esque ring to it. 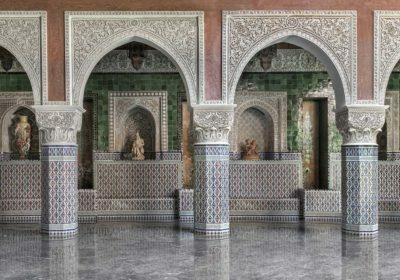 We spent a while in the main chamber as our guide showed us the skeletons and pots and explained everything in detail. Then it was time to head back to the outside world, and we swam, climbed and squeezed our way back the way we’d come. Emerging from the cave and into the sunlight, the experience wasn’t quite over yet: we had to hike back through the rainforest to our tour bus, where we were served a decent lunch with a few glasses of rum punch. 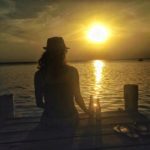 Gotta love Belize! 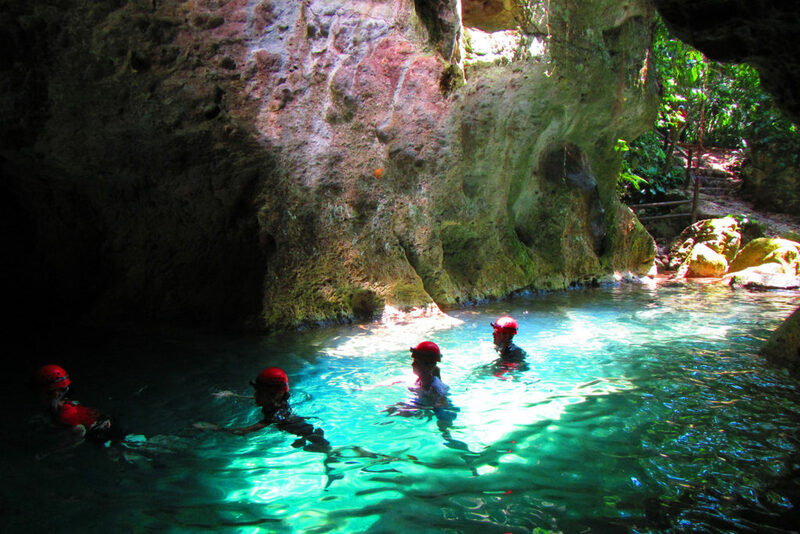 So, that was our Mayan cave adventure. 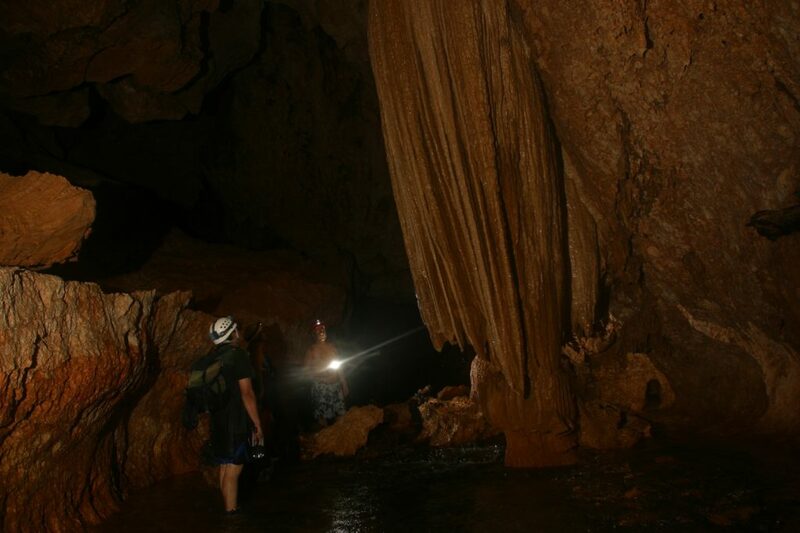 Everyone should go to Belize and do the Actun Tunichil Muknal cave tour! It really was the best activity we’ve done. 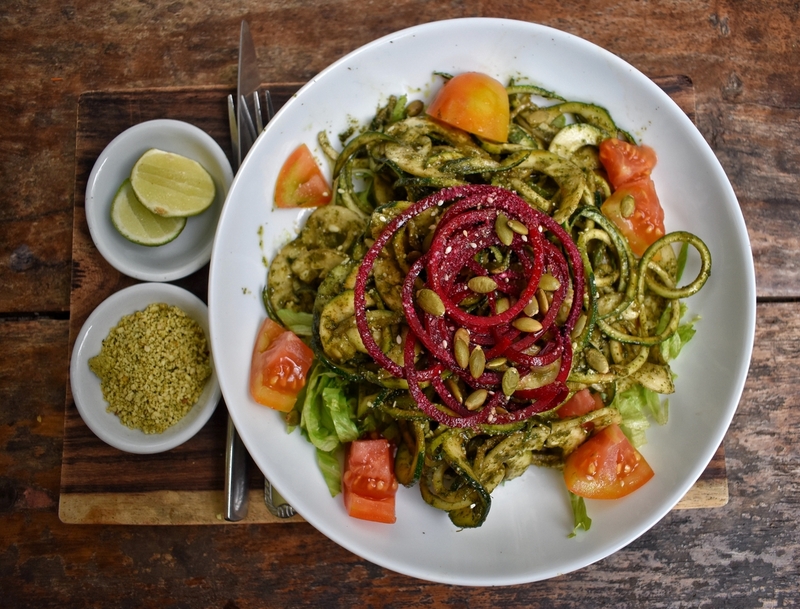 So, go to Belize.. but then go to Guatemala too, as that’s even better. But I’ll get to that soon! Who we did the tour with: Mayawalk. We definitely recommend them. 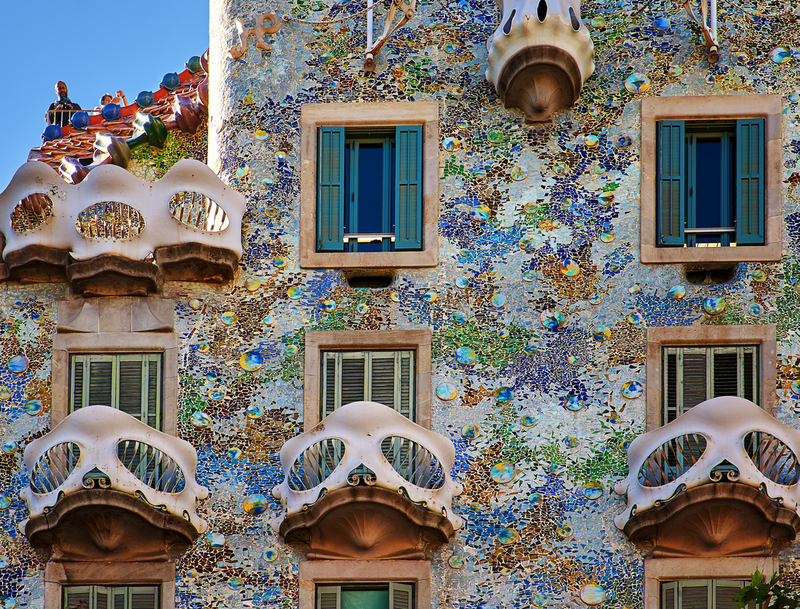 It was pricey ($85) but SO worth it – the guides know their stuff and are so enthusiastic. They’re much better than the guides from other companies, whose commentary was basically “look, there’s a Mayan pot… there’s a skull… there’s water over there.” Tom and I came out feeling like cave pros. 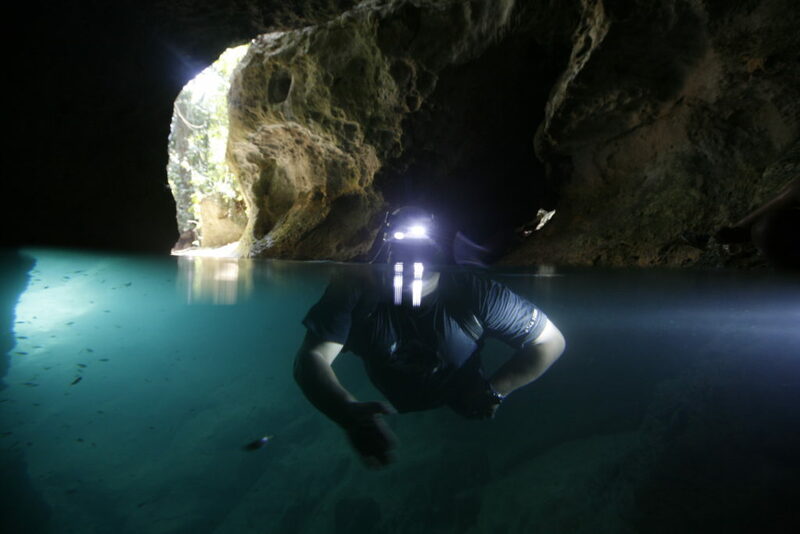 Mayawalk drive you to the caves and back and provide you with helmets, headlamps, waterproof shoes and a good lunch. Where we ate: I’ve covered this in my latest Food Republic article which will be live very soon.